Jesus did not die “on a green hill far away.” He was victim of a crude instrument of state torture along a busy road where passersby saw him close up. Like most political terror, from suicide bombing to lethal injection, crucifixion was meant to exact revenge and traumatize the public into conformity. Roman theatrics of terror forced Jesus to carry the crossbeam for his own crucifixion through streets of Jerusalem to a small quarry outside the city wall, to a rocky prominence called Golgotha that apparently looked like a skull. 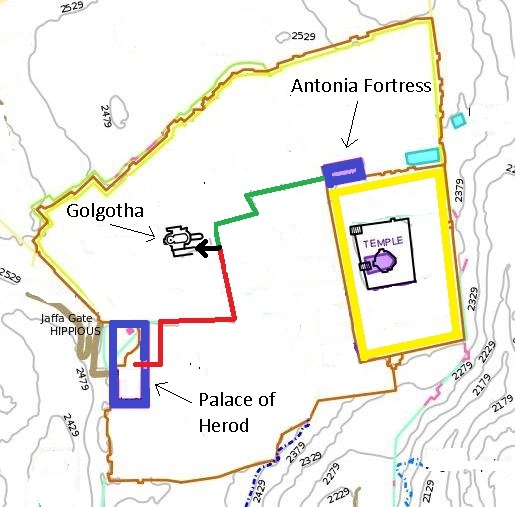 The traditional route of the Via Dolorosa, marked in green, goes from Antonia Fortress at the Temple to Golgotha. 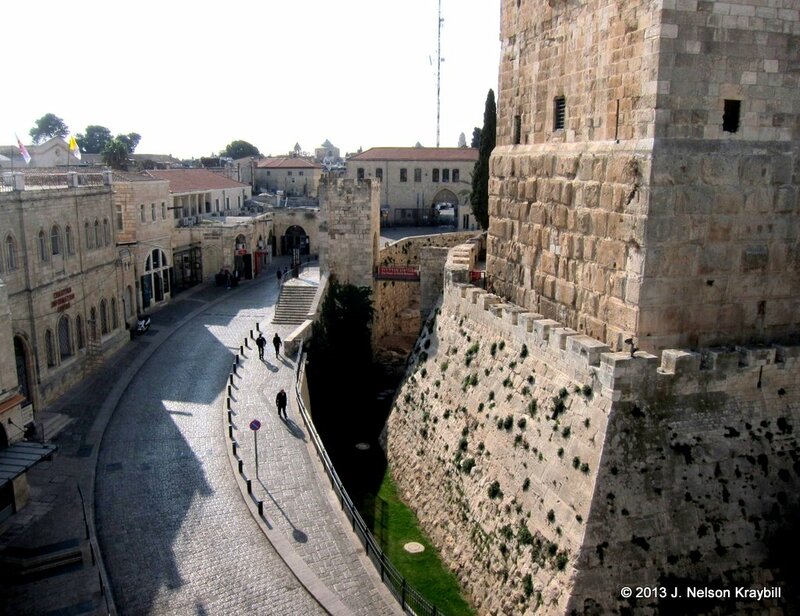 More likely Jesus carried his cross along the red route, starting at the Palace of Herod (today called the “Citadel” or “Tower of David”). Golgotha, the small quarry where Jesus died, today is within the Church of the Holy Sepulchre. In the first century Golgotha was outside the city wall; the city had not yet expanded to include that area. Christian pilgrims since medieval times have thought that the trial of Jesus took place at Antonia Fortress, a Roman facility adjacent to the Temple complex on the east side of old Jerusalem. But that building–a surveillance tower and military barracks that no longer exists–was not the praetorium or governor’s palace where the Gospel of John says the trial, flogging, and mockery of Jesus took place (John 18:28). The praetorium, rather, was what today we call the Citadel or “Tower of David” on the west side of old Jerusalem. The Via Dolorosa (“route of suffering”) along which Jesus carried his crossbeam, started here. Phasael Tower, so named by Herod the Great for his deceased brother, guarded the north end of the palace. It still stands. Archeologists have worked underneath areas adjacent to Phasael Tower for decades, and at last this year have opened what they found to the public. Astonishingly, one now can visit a large room that plausibly is where Jesus stood before Pilate. The lower two sections of the massive structure on the right are what remain of Phasael Tower built by Herod the Great. Jesus’ death by state-sponsored terror had the spiritual effect of sanctifying (setting apart for holy purpose) all who confess Jesus as Lord. His death had the political effect of pointing believers to citizenship in a “city which is to come” rather than in structures of empire and nationalism (Heb 13:12, 13). That city is the New Jerusalem–not simply where we go when we die, but a new political and economic order already taking shape on earth wherever believers abandon idolatry and violence and give allegiance to the Lamb (Rev. 22). This entry was posted in Uncategorized and tagged crucifixion, Golgotha, Herod the Great, Jerusalem, Phasael Tower, Praetorium, Via Dolorosa by nelsonkraybill. Bookmark the permalink.